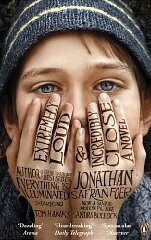 Continuing with the Book to Movie Challenge, I read and watched Extremely Loud & Incredibly Close. I'd heard both good and bad things about the book, and the film, so I was interested to see what I thought about each. Set in New York City in 2003, this novel follows the story of nine-year-old Oskar who lost his father in 9/11. Still grieving, and trying to make sense of why this tragedy happened, Oskar discovers a key in his father's belongings. It's inside an envelope with the word 'Black' written on it. In an attempt to bring his father closer to him, Oskar begins a quest to find the lock the key must fit. This journey takes Oskar all over New York as he meets a variety of people who all understand, and can relate to, his loss in one way or another. Alongside Oskar's quest the novel also includes letters by both his grandparents as they deal with their own heartbreak and disappointment. All the characters in the novel are survivors who ultimately learn a lot about themselves and about human nature. I was immediately drawn to Oskar and his quirky view of the world. I understood him to be a vulnerable, potentially autistic, kid who is suffering through a heartache that is too awful to imagine. I couldn't help thinking of all the real-life families who lost loved ones in 9/11, and how hard it must be to get over something so horrific. In that sense, this novel was very difficult to read. There is one chapter in particular where Oskar's grandma describes the awful day that was 9/11. The use of repetition of phrases such as 'planes going into buildings' and 'people falling' is a really powerful way to recreate the day in the reader's mind. I was very emotional while reading this section. The narrative itself is very well-written and I liked the way Foer interspersed sections written by Oskar's paternal grandparents to show the complicated backstory of the Schell family. By doing so Foer gets right to the heart of this family's grief. This might make it sound like the book is devastatingly sad throughout, but that's not the case. Foer successfully manages to get some humour in to the narrative. The novel is full of photographs and other images and drawings that really helped me to understand Oskar's mind and see the world through his eyes. Unfortunately, these didn't appear that clearly in the Kindle Edition that I read, but I still got a feel for each image. I would recommend buying this book in paperback. Extremely Loud & Incredibly Close is a powerful book about being afraid, about tragedy, about loss and regret, and about courage. Above all, it's a book about love. I enjoyed the movie a lot. At first Thomas Horn's voice annoyed me a little, but I soon got used to his style of acting and realised that he was actually capturing the quirky nature of Oskar pretty successfully. Tom Hanks and Sandra Bullock aren't in that many scenes, but they excel when we do see them on screen. Sandra in particular gives a heartbreaking performance in two pivotal, highly emotional scenes that had the tears running down my cheeks. I found the film even more intensely devastating than the book's narrative, even though the story is the same. That probably has to do with my own personal reaction to the actor's visible emotions and the visuals of the real 9/11. There are some differences between the book and the film. The Renter who lives with Oskar's grandma is the one to accompany Oskar on his quest, instead of old Mr Black as in the book. Without giving anything away, I will say I liked this better as it fits in with the story's idea of redemption and forgiveness. Two people are given an opportunity to heal old wounds and fill the gap in one another's lives. That's a beautiful thing to watch and very well acted by Horn and Max von Sydow. I couldn't fault the movie. It was the right amount of sad and hopeful. Sure it is slow at times, but still manages to be gripping all the same. Other reviewers have said the film honours 9/11 and I have to agree. This will always be a tough subject, but the film was real and very touching. I could see that Oskar and his family would respond to the tragedy in exactly the way they did. And I could see the people of New York being willing to help a grieving kid come to terms with his loss. This sounds like a beautiful book! I've never read a book that isn't a graphic novel but which includes images. It seems like that would be an interesting addition, although I have a hard time imagining how they would connect to the writing.